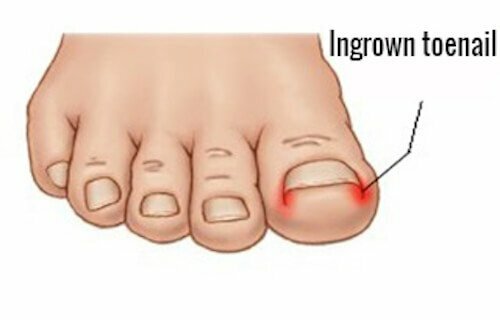 Ingrown Toenails can not only be irritating but they can also be painful! When the surrounding skin grows over the edges of one or both of the nails or when the nail penetrates the skin, an ingrown toenail is the result. An ingrown can occur for several reasons but poor nail trimming is the most common cause. This is because it encourages skin to fold over the nail. Other causes are likely to include trauma, stubbing a toe, skin conditions, fungus, or nails that are large. Sometimes ingrowns can be inherited. It is also important to wear proper fitting shoes as improper fitting shoes can cause or worsen the condition as well. As previously mentioned, it is important to wear good fitting shoes and socks. Also, be sure to protect feet from trauma as much as you can. While trimming toenails, take heed to trim straight across and be careful to avoid trimming the nail borders. Keep feet clean and dry as well. When pain, inflammation, swelling, or discharge occur, the toenail is probably infected. If you are a person with diabetes, nerve damage, or poor circulation, it is important to seek care immediately. Ingrown toenails are frustrating, but we can take care of them for you easily so you can get back to being comfortable in your daily routine. If you suspect that you may be suffering from an ingrown toenail, consider scheduling an appointment at Texas Foot & Ankle Specialists. We are conveniently located adjacent to the La Centerra outdoor shopping center across from Cinco Ranch High School in the Katy area of west Houston. We have convenient hours to accommodate a variety of schedules and can offer same day appointments most of the time for those with pressing needs.